Every time you or your client feels like eating, stop and think about it. Are you actually hungry or do you just want food? There's a difference between physical hunger and craving the taste or feeling of eating something. If you find your client eats just to eat something, start scheduling out meals and snacks instead of mindlessly snacking whenever you feel like it. 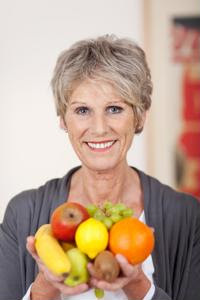 Seniors should always eat more fruits and vegetables than anything else during meals. When preparing your client's plate, fill one half with fruits and veggies and the other half with equal parts meat and grains. Allow your client to eat the foods he or she loves the most by making some dietary substitutions. For instance, always prepare whole grain pasta rather than white pasta, or use artificial sweetener instead of sugar if your client can't give up sweet tea or coffee.